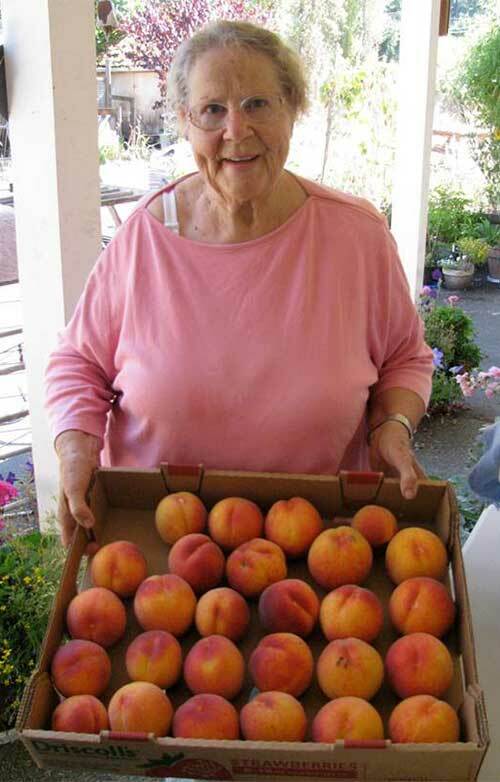 “My peach tree began as a peach pit in my compost. I dug it out and planted it in a pot. When it thrived, I planted it in the garden by my house 18 years ago. It is now 18 feet tall and wide, a big strong tree. …this tree is extremely healthy and productive. Peach trees on the coast are usually affected by a fungus that in spring destroys their young leaves. It’s called “peach leaf curl”. It weakens the trees and limits their productivity. This tree is resistant to peach leaf curl…a really special blessing. This year, it had a huge crop, more than 100 pounds. With help from my friend Ken, we picked the peaches and sold them to the local health food store and neighbours… the flavour of tree-ripened peaches is delicious.